What is my location number? To provide the best possible service, each location served by Federated has been assigned a location number. This number is keyed to our map system and computer systems and helps personnel easily locate you during a power outage or if you need some other service. 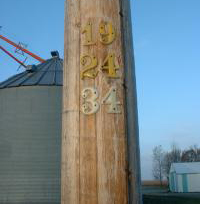 Always know your location number whenever you contact Federated Rural Electric. A sticker is available that has all of Federated's phone numbers written on it. Please place it in a place that is easily accessible (i.e. on the telephone, inside a cupboard door near the phone, etc). Federated customers also have an account number. It can be found on your bill. It is good to have it handy when calling in with questions, so customer service representatives can quickly look up your account. Call us during business hours or email us. Federated needs your new address, phone numbers (home, work and cell), date of move and Federated location number on meter pole (or name of previous occupant). To become a Federated member you are required to pay a $20 initiation fee. This fee entitles you to all of the benefits of membership and gets the appropriate records set up. A deposit will be required unless a good credit history is provided from your previous utility. At times, paying the entire electric bill becomes a problem for some members. Federated wants to work with these members to resolve their past due account. The most important item is to contact your cooperative about the situation and all possible efforts will be made to help solve the problem. If you are having a hard time paying your electric bill, different agencies may be able to help. The co-op member needs to contact the agency to determine eligibility. Although more than 90 percent of our members maintain excellent payment records, delinquent bills do become a problem for some individuals or businesses. Federated Rural Electric wants to work with these members to resolve their past due account. It is important to know our policies regarding disconnection and reconnection of service due to delinquent accounts, NSF checks and broken payment agreements. If you have questions, please contact our Collections Department at (507) 847-3520, (507) 728-8366 or 1-800-321-3520. Three weeks after the due date, a disconnect notice is mailed to all accounts that have not paid their electric bill. This notice informs the member of the amount past due and the date when the service may be disconnected if no action is taken to pay the bill. Should you receive this notice, you are urged to take one of the two steps listed below. Remit full payment of your bill before the disconnection date stated on the notice. Contact our Collections Department immediately if you are unable to pay your bill in full before the disconnection date stated on the notice to make payment plan arrangements. Failure to remit full payment, or failure to contact our Collections Department by the disconnection date stated on the notice, may result in disconnection. In order to minimize the risk of losses from unpaid electric bills, Federated Rural Electric will assess a deposit as a condition of receiving service. The security deposit will be the greater amount — either $100 or one month's electric charge according to the location's past history. This deposit will be waived if the member provides an acceptable credit letter from their previous electric supplier or an acceptable Federated credit history if the member is or was a Federated member. The security deposit is refunded with interest after 12 months if the member's credit rating is acceptable. If the member has an insufficient credit history, the charge will be two times the average monthly bill. Call Federated Rural Electric at least one week before the date of your move; let us know the final date that you are responsible for the electric bill. A forwarding address is also required so your final bill and future capital credits can be mailed to you. Are you adding electric load? The system bringing electricity to you is sized as close to the load at the site as possible for efficiency reasons. Please contact Federated if you make any major additions or deletions to the electric equipment you routinely use, such as corn dryers or confinement buildings. Failure to do so may result in a power outage at your location or a delay in serving your new load.